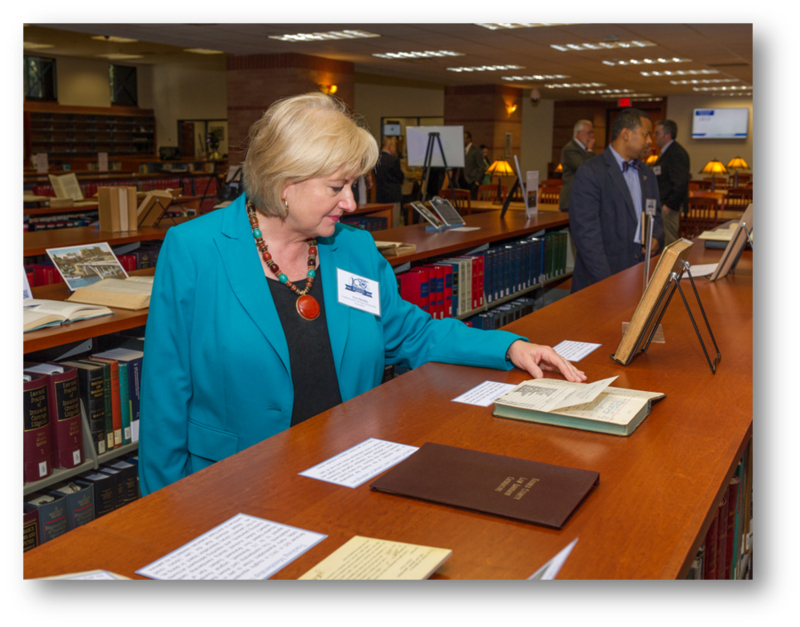 The local legal community gathered at the Harris County Law Library on October 1, 2015, from 3:30 p.m. to 5:30 p.m., to celebrate the Law Library's century of service. Keynote speaker, Chief Justice Nathan L. Hecht of the Supreme Court of Texas, captured the essence of the event when he said, "This library, for 100 years, has been a bastion of legal knowledge for Houston, enriching the community. That's a good reason to celebrate." Explore this page to find photos and anecdotes from the Centennial Celebration. The centerpiece of the Centennial Celebration was a speakers program featuring keynote speaker Chief Justice Nathan L. Hecht of the Supreme Court of Texas. The Chief Justice was joined by Harris County Attorney Vince Ryan, HBA President Laura Gibson, 14th Court of Appeals Justice Brett Busby, Law Library Director Mariann Sears, and Deputy Director Joseph Lawson. Visit the Centennial Celebration page on the Harris County Attorney's YouTube Channel to see video of the event. Guests were treated to more than 15 exhibits on display featuring items of interest from the Law Library's collection. 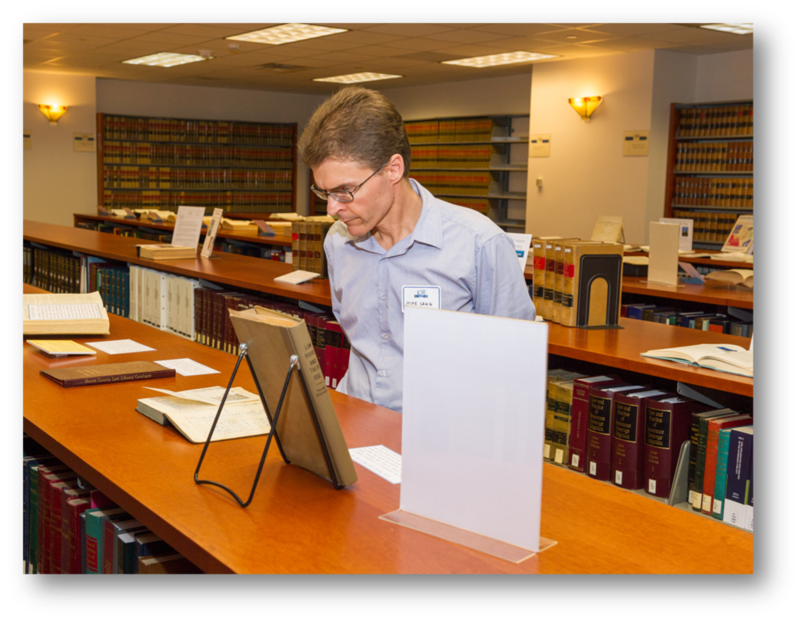 Guests could find the Law Library's oldest monograph in the "Magna Carta" exhibit, poetry written by judges and attorneys in the "Poetry of the Bench & Bar" exhibit, HBA pictorial rosters spanning four decades in the "Faces from the Past" exhibit, and more. 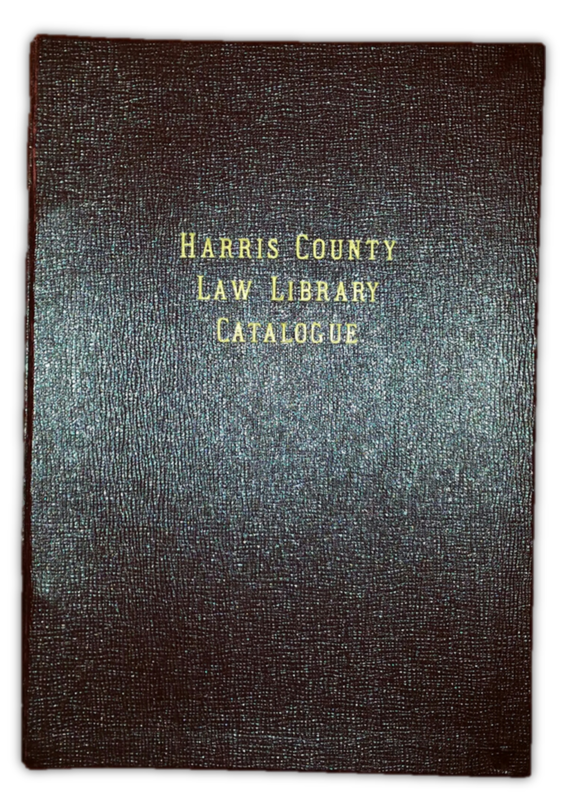 Guests received copies of the Harris County Law Library Catalogue, which was originally published in 1949 and distributed to members of the local bar to help them make use of the Law Library's resources. Given the historical focus of the Centennial Celebration, it was a treat to give guests an actual piece of history to take with them. 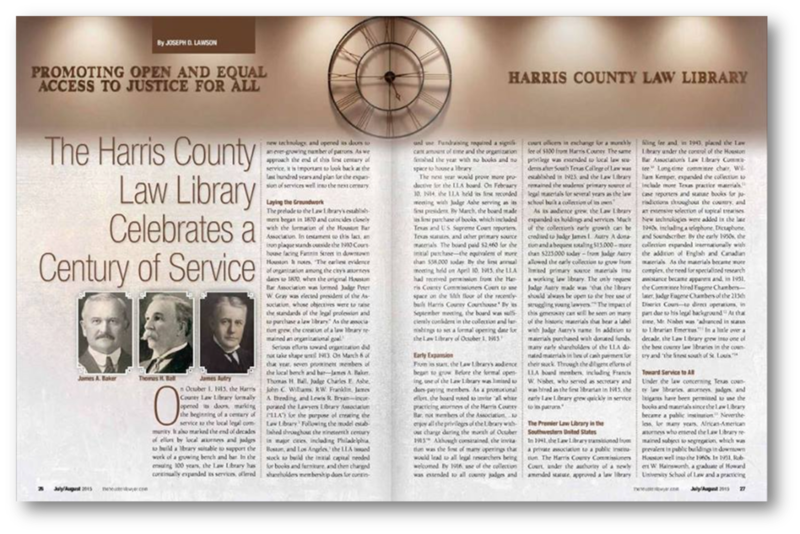 Guests also received copies of the July/August 2015 issue of The Houston Lawyer containing an article written by the Law Library's Deputy Director about the institution's 100-year history. Copies of the publication were generously donated by the Houston Bar Association. Click the photo to access the full article. Several organizations contributed to the success of the Centennial Celebration. We would like to thank Baker Botts and Andrews Kurth for sponsoring refreshments and Thomson Reuters for sponsoring refreshments and parking for our guests. We would also like to thank ServiceDocs, Inc. for providing printing services and audiovisual equipment for the event. Click on a logo to visit a sponsor's website.